Certification and Recertification forms have now been updated on the site. The forms reflect the recent changes and are no longer a zip package but a single, fill-able PDF form file. Much easier to download, open and complete! Current Peer Support Specialists can now request a new certificate and wallet sized certificate for lost certificates or name changes. Visit the Request Certificate page found under the main Certification tab near the top. 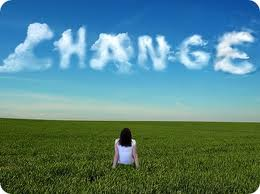 The North Carolina Peer Support Specialist Program is undergoing some changes. These changes will affect the application, recertification, and the course development and submission processes. Please take note of the changes outlined on this flyer and the effective date of July 2, 2018. Any mail post marked June 30, 2018 will be subject to these new changes.The North Carolina Peer Support Specialist Program is undergoing some changes. These changes will affect the application, recertification, and the course development and submission processes. Please take note of the changes outlined on this flyer and the effective date of July 2, 2018. Any mail post marked June 30, 2018 will be subject to these new changes. Introducing a new wallet size card (to be added to certificates). NCCPSS 40 hour courses for approval will only be accepted 1-7 April and 1-7 October every year. 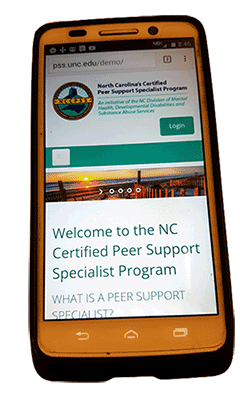 The NC Certified Peer Support Specialist (NCCPSS) program will be making changes to the course submission and review process to go into effect in July, 2018. As a result of these upcoming changes, the Behavioral Health Springboard (BHS) will not be accepting new courses for review, effective immediately. We understand the inconvenience this situation may cause persons interested in submitting new courses but the course review committee has a number of courses under review and would like to focus and complete these reviews before the new changes take effect in July, 2018. 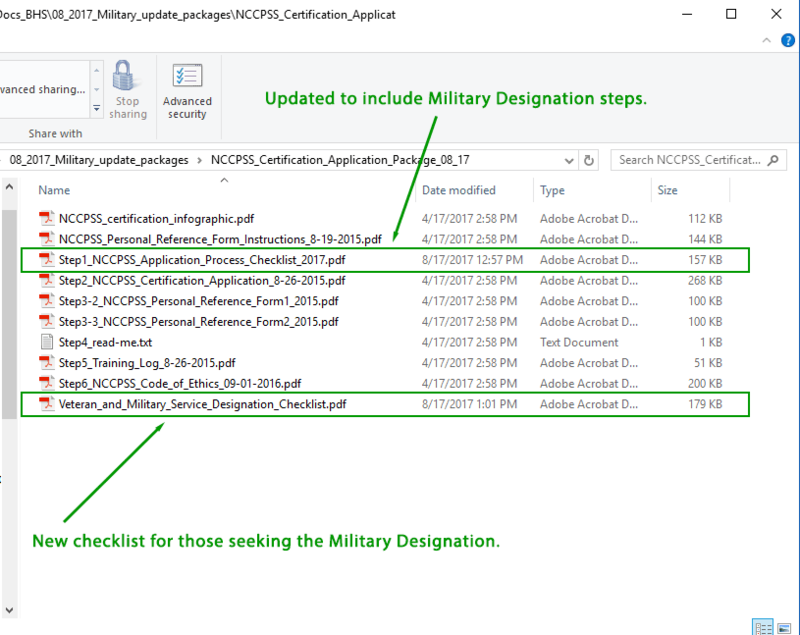 Application Packets Updated for Military Designations Steps. Both the Certification and Recertification application download packets have been updated today to reflect extra steps need for the Military Designation credential. Bear in mind this only affects those who are seeking the Military Designation. Image shows the exact files affected in the packets. Read more about Application Packets Updated for Military Designations Steps. Effective April 1, 2017 Recertification Applications and necessary forms will no longer be mailed out prior to recertification dates. Emails will be sent as a reminder with the recertification forms attached 60-90 days prior to your recertification. If you do not have an email on file, recertification forms will be sent to your mailing address that is on file. You can complete the forms either electronically or by hand. Once forms are compete, print if you haven’t and mail all requested documents to the Peer Support Registry. A section dedicated to the new NC CPSS military designation has been added to the site. This area will handle the specific requirements and resources for this new designation. You will find the basic eligibility requirements and additional steps needed in this site section. Also there is a page dedicated to the recertification process that will hold military specific training websites and resources. Please explore the new section! 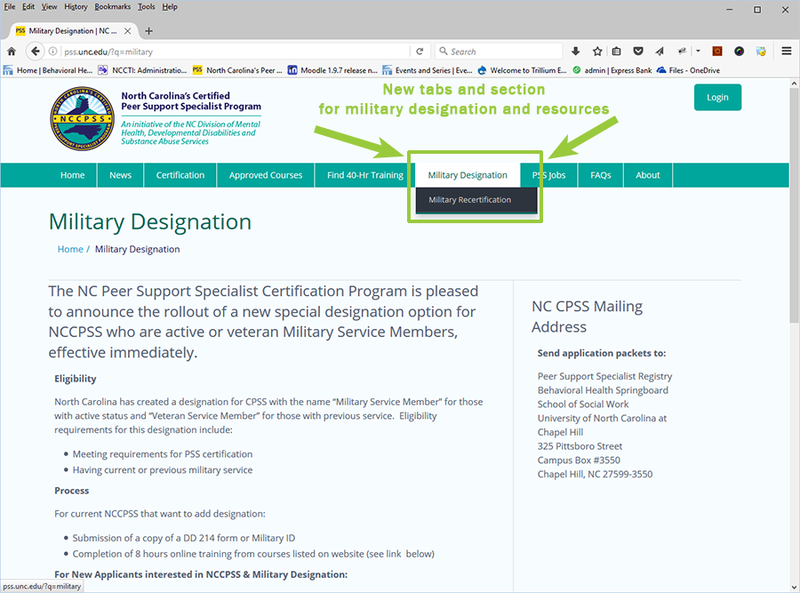 The NC Peer Support Specialist Certification Program is pleased to announce the rollout of a new special designation option for NCCPSS who are active or veteran Military Service Members, effective immediately. 12 hours of human service, mental health, and/or substance use training at time of recertification. The new site would make a much stronger emphasis on the Peer Support Specialist Certification Program and less so on Behavioral Health Springboard. Information would be better organized and shaped by survey data and Google Analytics data. Visually, the site would be easier to consume and the most frequently visited areas would be brought forward to the front page (certification, training, jobs). The site would use contemporary technology and be accessible on mobile devices; check it out on your phone or tablet! Please take some time and explore the site using the new menu bar near the top. You will quickly find information on NC PSS certification process, upcoming training opportunities, and the latest job posting around the state. Also be sure to click on our new info-graphics that illustrate and help simplify the steps to becoming a certified Peer Support Specialist all on a single page. Thanks to all the peers who contributed through survey responses, ideas and early testing! Applicants submitting either their certification or recertification application will now be required to include in your packet a signed and dated copy of The North Carolina Certified Peer Support Specialist Code of Ethics. Applications will not be processed until all documents are correctly submitted postmarked after July 31, 2015.